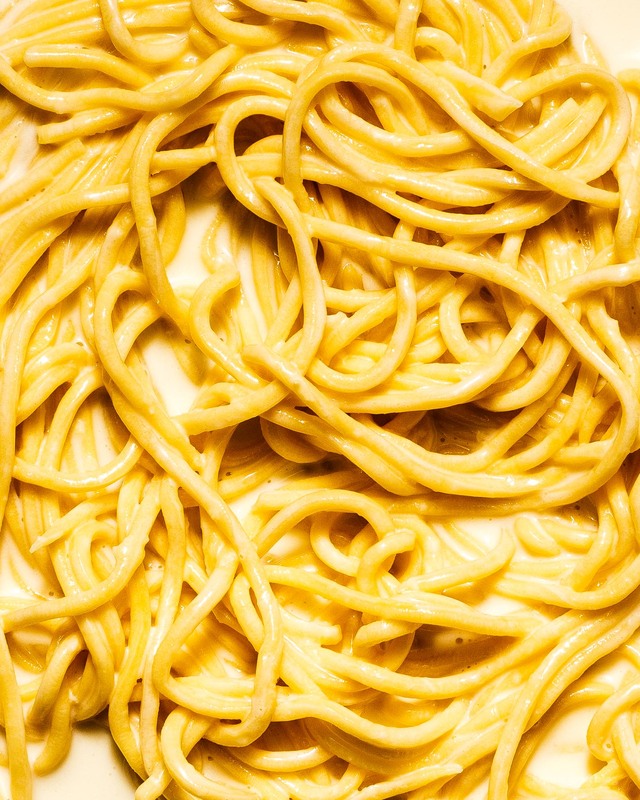 If you like that noodle life, this creamy, lemon-y pasta is for you. 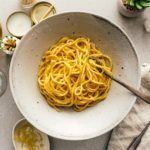 A simple, comforting date night recipe that’s simple enough for any day of the week: creamy, dreamy lemon pasta. Valentine’s day is coming up. I feel like that is a statement that invokes equal parts dread and delight. Are you the kind of person who loves Valentines? Or are you of the opinions that it’s one of those silly commercial holidays tailor made to convince people to spend more money? I feel like it’s a bit of both for me. I love the idea of celebrating love. I mean, what’s not to like about that? But, I also feel like a lot of people feel pressure to have that perfect date or gift. I remember being so lonely on Valentine’s day when I was younger and single. A relationship seemed so out of this world to me. I used to spend hours in my room as a teenage girl, watching rom-coms and dreaming of someone to call my own. I was convinced that if I ever had a boyfriend, Valentine’s would be a whole crazy (good crazy) affair. The funny thing is, now that I am in a relationship, we don’t really make a big deal out of Valentines. That’s not to say that I don’t feel completely out of this world lucky to have won the love lottery with Mike. It’s just more that it’s really the small moments that feel extra romantic. It’s him bringing home a bag of my favorite chips at the end of the day. Or us pausing Netflix in the middle of watching a confusing – yet strangely addictive – Chinese show that’s 70 episodes long and kind of sort of Game of Thrones-y to discuss what the heck is going on. It’s things like making dinner together because he knows it’s one of my favorite things to do. 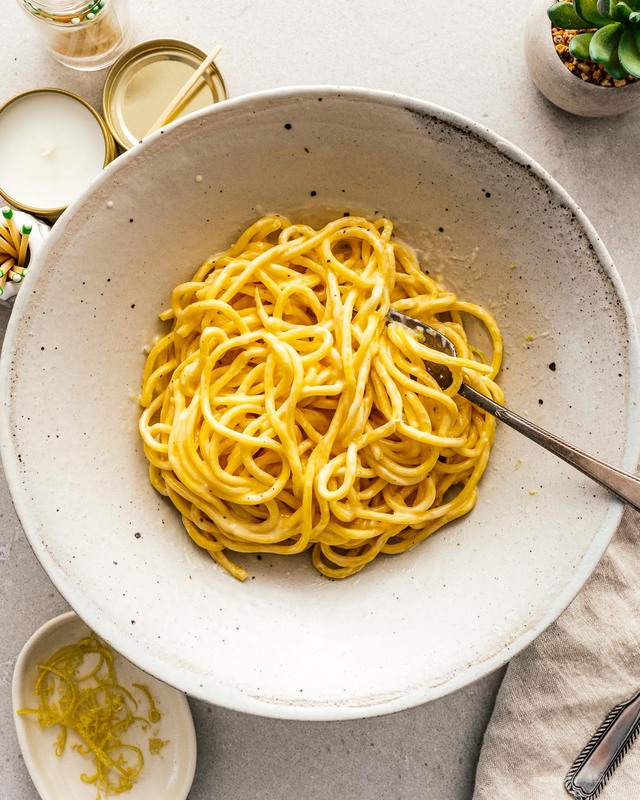 This lemon-y pasta, called al limone in Italian, is absolutely delicious. It’s fancy enough feeling for date night while being very easy to execute. 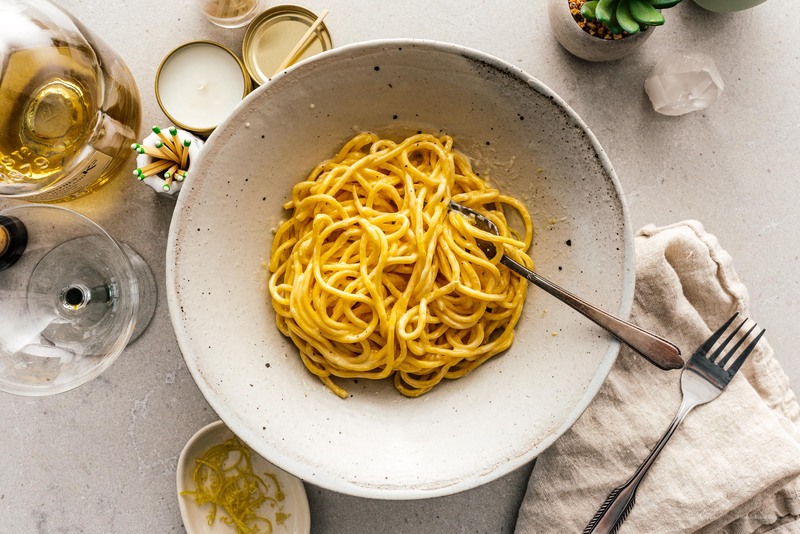 The sauce is bright and floral from the lemon zest with heavy cream for a luscious oomph, butter for that glossy restaurant style sauce, parmesan because cheese, and a finish of punchy fresh lemon juice which helps everything else come together. It’s everything you never knew you wanted in a bowl of noodles. I did a thing and made spaghetti alla chittara, a square shaped spaghetti, from scratch, but this recipe will work with any kind of noodle. You could even go short if you wanted, but there’s something infinitely satisfying about twirling and slurping these guys so I’d recommend anything long. Use a vegetable peeler to remove a 2 inch long strip of lemon zest. Slice into thin strands and set aside for serving. Finely grate/zest the lemon. Squeeze out 1 tablespoon of fresh juice. In a large pot of salted boiling water, cook the pasta 2 minutes shy of al dente according to the package. While the pasta is cooking, add the lemon zest and cream to a large skillet and cook over medium heat, whisking, until it just starts to simmer, about 2 minutes. Turn the heat to medium low and whisk in the butter, until creamy and emulsified. Remove from the heat. Just before the pasta is al dente, scoop out 1 1/2 cups of the pasta water and reserve. Add 6 tablespoons of pasta water to the cream sauce and return to medium heat. 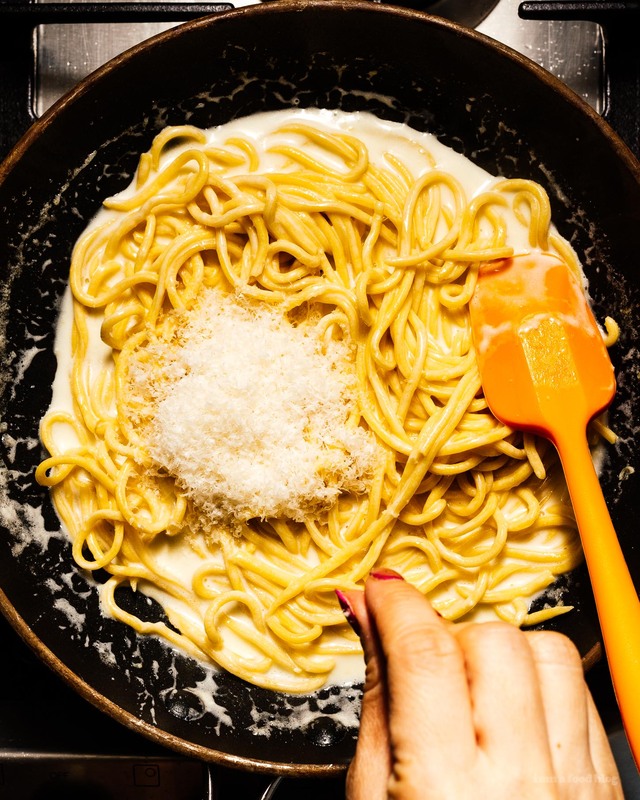 Use tongs to transfer the pasta to the pan with the sauce and cook, tossing, and adding parmesan, little by little, until the cheese melts and the sauce is glossy and coats each strand. 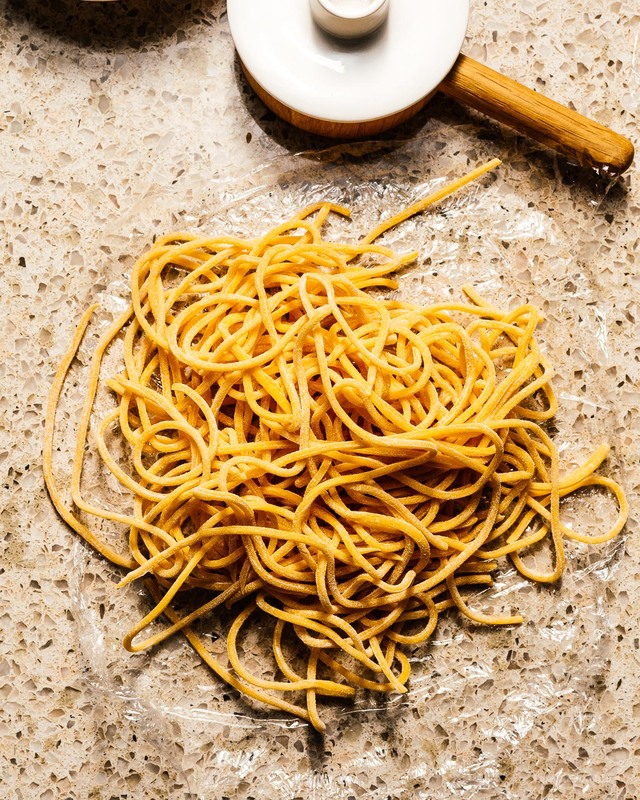 If needed, loosen out the sauce with 1-2 tablespoons more pasta water. Cream sauce tends to thicken as it cools, so add in a bit more water than you think you need so that you have quite a bit of sauce. Stir in the lemon juice and season to taste with salt. Serve, finished with freshly ground pepper and the reserved lemon zest strips. Galaxy Glaze Doughnuts and a KitchenAid® Artisan® Mini Mixer Giveaway!